A thunderstorm during the summer shouldn’t surprise you. That is unless you are in your yard taking care of your trees. A thunderstorm during the summer shouldn’t surprise you. That is unless you are in your yard taking care of your trees. These storms are loud and bring with them plenty of wind and rain, and sometimes lightning, so you never know what can happen to your trees. Have you ever entered a parking lot and looked for somewhere to park? You could be running into the store for tree care supplies. Let’s imagine that someone knocks on your window and offers to repair a scratch on the side of your car for a particular fee. If it sounds too good to be true, then it probably is. Scams like those could happen when unscrupulous people try to take advantage of your misfortune. 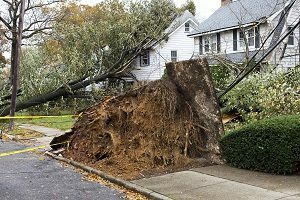 Even if your tree has survived the storm with only small amounts of damage, don’t let them damage your trees even further. Now that the storm is over, it should be safe to go outside. Walk up to your tree and inspect it. All the same, watch out for falling branches that could fall on your, or limbs that have been scattered across the yard that are now tripping hazards. Making a hasty decision about your tree could make the situation worse instead of better. If power lines have tangled in the tree, you should stay clear and notify your county or power provider. If the tree swing has been ripped to the ground, you can replace it after the tree is looked after. Carefully cut away any dead wood on your tree. However, your trees can last a long time even after they’ve had a close encounter with a storm. This is especially true of younger trees. However, if your tree still seems sick after a month or two, then it might be time to rely on the expertise of the professionals at Nelson Tree Specialist. This entry was posted on Friday, June 29th, 2018 at 3:49 pm. Both comments and pings are currently closed.